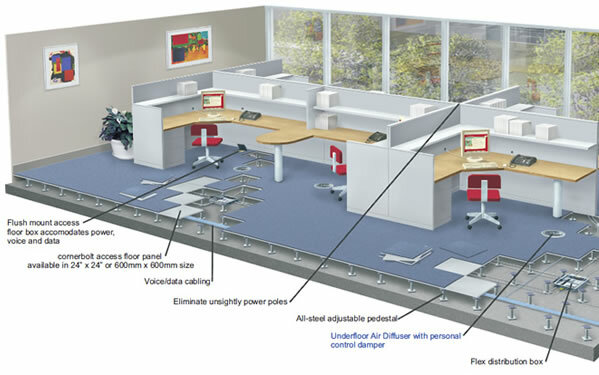 Raised flooring is one piece of a building infrastructure that enables building owners and managers to provide a flexible, energy efficient, low-cost facility that meets the needs of its employees and tenants. A raised floor can decrease initial construction cost and time, while making future moves and changes less expensive and disruptive. Improvements to air quality and energy efficiency are obtained by forcing clean air from the floor. Hot/cold complaints can be decreased by providing occupants control over their space’s diffusers. Save 20% or more on your HVAC energy costs by using under-floor air distribution.